ASME B16.5 is the standard specification for pipe flanges and flanged fittings sized from NPS 1/2 (DN 15) to NPS 24 (DN 600). 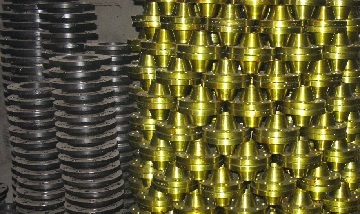 It is the most widely used flange standard in piping industry. This standard is developed by the sectional Committee B16 of Americal Standards Association (ASA). It is derived from the 1932 revision of ASA B16E. During its development history, the standard had been published as ASA B16.5, ANSI B16.5, ASME/ ANSI B16.5. Then, on October 3, 1996, it was approved with the new formal designation ASME B16.5. So far, we have several editions of ASME B16.9: 2003, 2009, and 2013. Pipe flanges manufactured to ASME B16.5 can be used in miscellaneous applications or services including oil & gas industry, chemical and petrochemical processing, pharmaceutical industry, water supply, sewage treatment, civil construction, power plant, offshore platforms, food industry, pulp and paper industry, etc. The ASME B16.5 flanges can be made from cast, forged, or plate materials covering carbon steel, alloy steel, stainless steel and non-ferrous alloys. They can be used at either low temperatures, medium temperatures, or high temperatures based on different materials. ASME B16.5 flanges in stock: slip on(SO), weld neck(WN), with black or yellow painting, ASTM A105. The ASME B16.5 flanges are designated in 7 rating classes: Class 150, Class 300, Class 400, Class 600, Class 900, Class 1500, Class 2500. Flanges rated Class 150 ~ Class 1500 are furnished in sizes NPS 1/2 [DN 15] through NPS 24 [DN 600] and flanges rated Class 2500 are furnished in sizes NPS 1/2 [DN 15] through NPS 12 [DN 300]. The flange types include weld neck(WN), slip on(SO), threaded(THD), socket welding(SW), lap joint(LPJ), blind(BL), long weld neck(LWN), and reducing flange. The end flange facings can be furnished as raised face(RF), ring joint face(RTJ), flat face(FF), large or small male/female face, small male/female face, large or small tongue face, and large or small groove face. Among all of the facings, raised face(RF) and ring joint face(RTJ) are most commonly used. You can click below table to see the dimension and weight details for each class rating of ASME B16.5 pipe flanges.